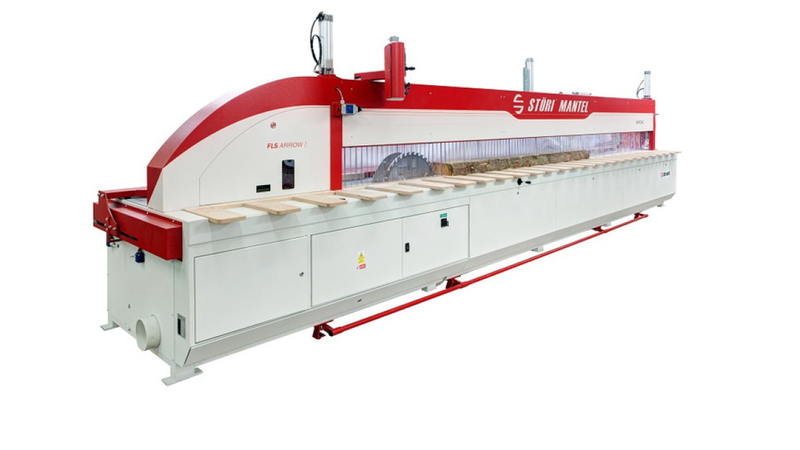 Modern processing technology of solid wood with using one blade rip saw FLS 160 ECO significantly increases yield and productivity and values the quality of wood material. Emphasis on the cut quality and simplicity of service is a matter of fact. Highly universal saw FLS 160 ECO finds application mainly in small and medium-sized plants. The FLS 160 ECO can cut prisms, planks, beams and large-area material. Input materials can be plastered, trimmed, formatted and it is possible to produce cardboard plates and lamellae. It can be cut at an angle and miter. The advantage of the machine is high speed and accuracy of cuts and high degree of flexibility of input and output dimensions of the processed material. FLS 160 ECO is valued in furniture workshops, production of semi-finished products for windows, doors and stairs. The machine can be also used for cutting non-wood materials, e.g. polyurethane panels, sandwich panels, plastic plates, aluminium plates, etc..
Chain setting – the automatic movement to the specified value (decrease of the total width + saw kerf). Optimization system – automatic combination of widths in one material according to the operator preset values (width optimization for maximum yield). Infinitely adjustable blade feed speed 0 – 60 m/min. guarantees high cutting performance. Infinitely variable feed rate with the control panel of the machine. Control of the stroke blade ensures a clean cut and cut surface quality. Changing of the blade is easy and safe – quick cramping of the saw blade.